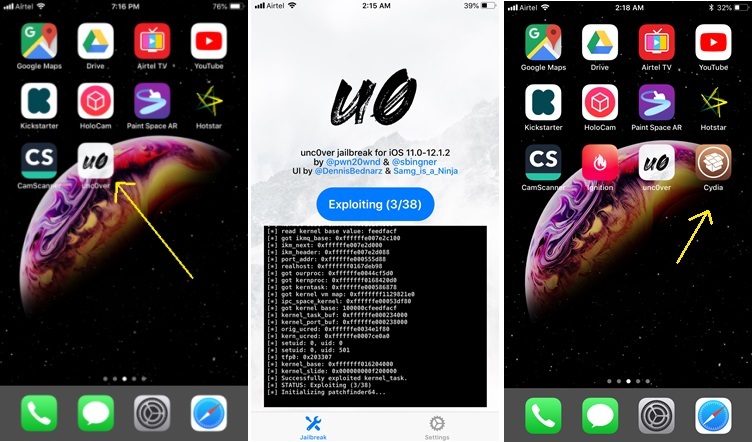 The latest beta of the Unc0ver Jailbreak tool now enables us to jailbreak iOS 11 to iOS 12.1.2 using Uncover and install Cydia. Towards the end of February, a new jailbreak tool, ‘unc0ver 3.0.0’ was released by developer Pwn20wnd for iOS 12.1.2. Though the initial release had its share of bugs and restrictions thousands of early adopters took to jailbreaking their iPhones and iPads using unc0ver 3.0.0. Since then, the developers have updated ‘unc0ver’ tens of times within just a couple of weeks. They not only added Cydia and Cydia Substrate but also made the tool more and more reliable with each iteration. Unc0ver 3.0.0 beta 46 extends support to older versions such as iOS 11. On the other hand, unc0ver jailbreak is now offering support to iOS devices running on A7 SoC’s and A8 SoC’s. Prior versions of unc0ver only supported iOS devices that had A9, A10 and A11 SoC’s on board. 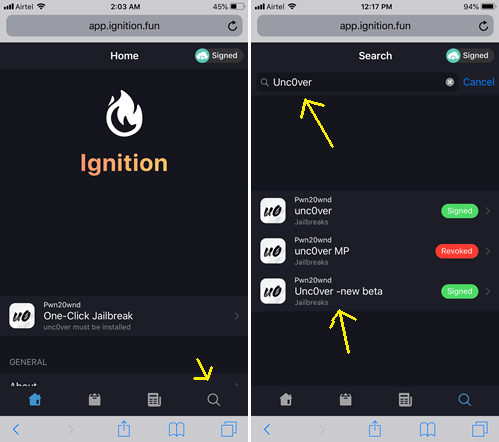 The latest beta 46 can jailbreak iOS 11 to iOS 12.1.2 using unc0ver and install Cydia on all iPhones and iPads that meet the following two conditions. If they are running iOS 11 to iOS 12.1.2 as well as a Pre A12 System on Chip, they qualify. “Well, which ones exactly are they?”, you may ask. That is why we have compiled the list of all compatible iDevices down below. iPhone XS, iPhone XR, iPhone XS Max. Additionally, support for the latest iPhones and iPads with A12 SoC’s is currently being worked on. Before proceeding to jailbreak, we recommend backing up your data since there are chances that a jailbreak may not end well. A back up is useful in case a software failure makes data retrieval impossible. Secondly, delete any OTP updates of iOS downloaded and stored on your device. Go to Settings>General>iPhone Storage, then scroll down to look for the iOS update around 1Gb and delete it. Make sure there is enough space on the device so that the jailbreak doe not fail. 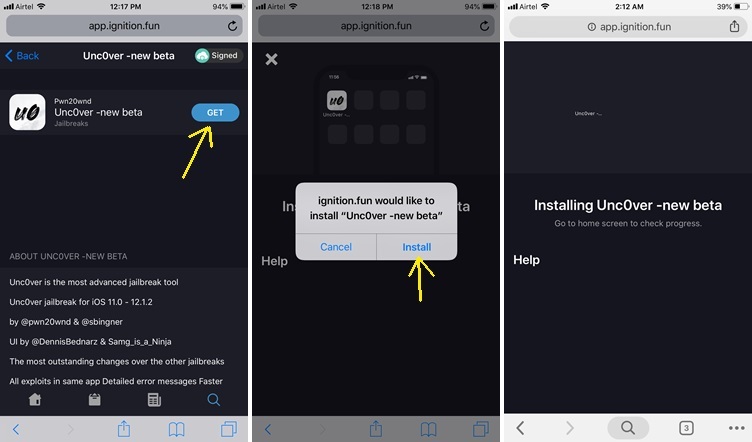 Step 1: Open Safari or Chrome on your iPhone/iPad in order to visit the website ignition.fun. When the page opens, chose the ‘Use Now (Web)’ option. Step 2: On the next page you will see four options at the bottom. Those symbols are tabs representing Home, Apps, News and Search. Tap the Search option and type Unc0ver to search for the jailbreak package. Tap on the search button and search Unc0ver. Step 3: This will lead you to the results page. Select the Unc0ver -new beta package and tap get. Select install in order to start installing unc0ver jailbreak tool to your Home Screen. Step 4: As soon as the Unc0ver app gets installed to the Home Screen, open Settings and then trust its developer. 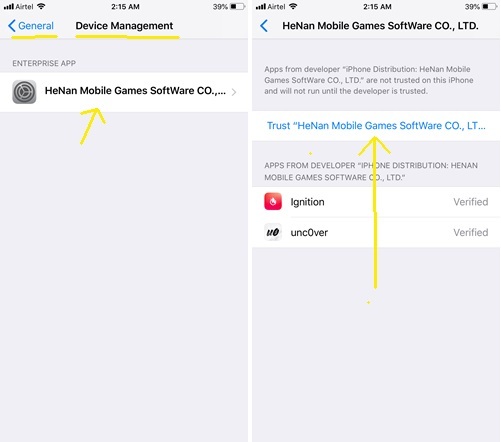 In order to do that go to Settings>General>Device Management and tap on ‘Trust “HeNan Mobile Games Software CO.,…’. This trust is necessary in order for unc0ver jailbreak to work on your device. Step 4: When you’re finished trusting the developer, open the Unc0ver app on your home screen and tap on ‘Jailbreak’. This would in effect start the jailbreak process. 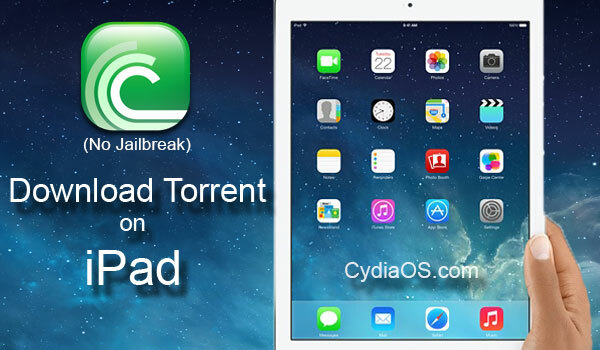 Soon as the jailbreak is finished the device would reboot and you will see Cydia’s icon on your home screen. That is pretty much it. You can now open Cydia in order to customize your iPhone or iPad and use the numerous tweaks available on the platform. 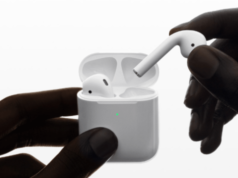 Next articleShould you buy the new 2019 AirPods 2nd Generation?